Ladbrokes Bingo, owned by the world’s favorite gaming company Ladbrokes Plc, is quite familiar to a large number of online bingo enthusiasts. The site presents a great online venue for bingo players seeking a thrilling gaming environment with unlimited games, promotions, and jackpots. 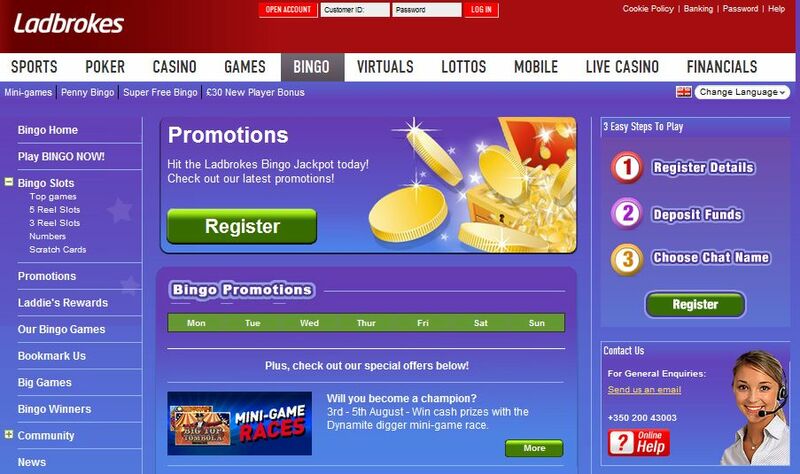 The most thrilling aspect of Ladbrokes Bingo, especially for newly registered players, is its welcome bonus of £20. The site does not have a no-deposit bonus, but it has recently modified its first depositor’s bonus for the benefit of newcomers. Players must deposit a spent only £5 at Ladbrokes Bingo in order to receive a bonus of £20, absolutely free. Previously, players were required to deposit and spend £10 in order to be eligible to claim its welcome bonus. The site will credit players’ accounts with the free welcome bonus of £20 within 3 days of spending their initial deposit of £5. Ladbrokes Bingo enjoys great popularity for its thrilling promotions, of which the hottest appears to the World Cup Free Bingo, which is based on the World Cup theme and gives players a chance to enjoy the match as well as loads of free bingo; the World Cup Mini Games Turnover Race, challenging players to win a cool amount of £1,000; Goal Bingo, in which players can win a share of £15,000; BOGOF bingo, which offers double the fun at the rate of one; Who Wants to Be a Millionaire; which is played on Wednesdays and gives players a chance to become a millionaire by spending only 10p; Cheap Tickets Tuesday, a special promotion of cheap tickets; and Celebrity Quiz, which contains only 10 questions, but gives players the chance to win £50. Ladbrokes Bingo supports a wide range of payment options such as Western Union, Paysafecard, credit cards, wire transfers, and PayPal, to mention just a few. Moreover, the site divides players’ gaming accounts into separate wallets for separate products; and bingo players must make their deposits into the “Games and Bingo” wallet only. Bingo players do not have to download anything onto their PCs because Ladbroke’s software, which is developed by Virtue Fusion, allows players to enjoy the games directly from their browsers. Ladbrokes Bingo offers 6 major bingo games in a number of exciting bingo rooms. Bingo players can enjoy 90 Ball games in the site’s Lounge, Bedroom, Attic, and Who Wants to Be a Millionaire Rooms; 90 Ball Speed games in the Garage; 80 Ball games in the Basement; 75 Ball games in the Snug; and 75 Ball Pattern games in Room with a View. The bingo site also offers 3 varieties of pattern games called static, crazy, and wild; Joker Jackpot; and scores of exciting bingo chat games with prizes and mini games, which can be played while waiting for the next major bingo game to start. The online bingo gaming site has a top quality customer care system; and players with problems and queries can contact the site by phone or email them via their website. Do you use multiple computer screens to play online poker?